Javier Rodriguez noticed it... so did Jorge Dispari, Ney Melo, Sergio Cortazzo... and numerous other visiting teachers to Sydney - our floorcraft is generally Bad. And last night was no exception.Why? 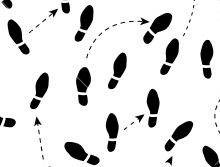 Good floorcraft is basically good manners and following a few simple rules about proceeding in line of dance. Sydney is sometimes described as brash - we are not known for our good manners. My daughter who has recently returned from living in the USA remarked recently that manners on Sydney's roads were worse than those she had experienced in nearly 3 years of driving in LA!